Lakewood outfielder, “C” Randolph began his rehab batting third. He drew a 5-pitch walk. It appeared that “C” thought he saw 5 balls and no strikes during the at bat. More to follow in the GCL Recap. Lehigh Valley (45-35) Lost to Columbus, 5-2. David Buchanan (4-5, 4.77) gave up single runs in each of his first four innings, and 5 runs in 5.1 innings. He surrendered 8 hits, including 2 HR, and struck out five. Phil Klein (0.00) struck out 4 in 2.2 innings. Nick Williams returned to the line up and drove in both of the IronPigs’ runs. #1 Crawford (.227) went 2-4. #3 Williams (.288) went 2-4 with 2 RBI (38). #9 Knapp (.258) went 0-4. Reading (56-23) Beat Erie, 14-1. Nick Pivetta pitched 3.0 scoreless innings before giving way to Jeremy Bleich (4-1, 3.28) who got the win. Daniel Stumpf made his initial AA rehab appearance retiring all three batter he faced. After the game, Mike Drago (Reading Eagle) reported that Pivetta was removed due to groin tightness, according to manager Dusty Wathan. Harold Martinez (.260) led the way with three hits, his 6th HR, and 3 RBI (29). Dylan Cozens, Rhys Hoskins, and Osmel Aguila (1) also homered. Fox raised his RBI total to 48 with two. #6 Alfaro (.301) went 1-4 with 3 runs scored. #15 Eshelman (1-0, 1.80) – DNP. #18 Pivetta – (7-4, 3.31) – 3.0 IP, 2 H, 0 R, 0 ER, 2 BB, 2 K.
#19 Hoskins (.291) went 2-5 with a HR (21) and RBI (62). #22 Cozens (.276) went 2-4 with a HR (21) and 2 RBI (62). #27 Brown (.235) went 1-4 with a double and RBI (21). Clearwater (43-32) Lost to Dunedin, 8-1. Yacksel Rios (2-2, 3.60) gave up 6 runs on 7 hits in 5.0 innings. He walked 2, hit 2, and struck out none. Malquin Canelo had 2 of the Threshers’ four hits. Kyle Martin (.238) provided the offense with his 10th HR and 44th RBI. #11 Kingery (.284) went 0-2 with a BB, HBP, and SB (21). #12 Canelo (.243) went 2-4 with a double. #14 Tocci (.279) went 0-4. Lakewood (33-43) Lost to Hagerstown, 8-2. Harold Arauz (3-5, 4.20) struck out 6 in 6.0 innings, but gave up 5 runs. The BlueClaws scored two runs on 5 hits. Josh Tobias (.303) had 2 hits, a HR (6), and RBI (48). 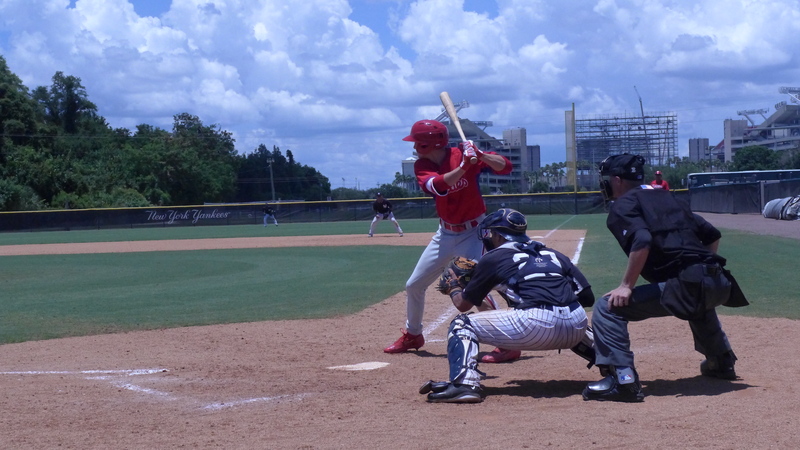 #5 Randolph – DL, shoulder, rehabbing in GCLgames in Clearwater. #29 Grullon (.255) went 0-3 with a BB. Williamsport (7-6) Swept a double header from Tri-City, 8-5 and 7-3. Game One: Won 8-5. Ranger Suarez (1-0, 3.45) allowed 4 runs on 6 hits over 5.0 innings. David Martinelli (.200), Luis Encarnacion (.233), and Henri Lartigue (.300) had 2 hits apiece. Lartigue also had his first three RBIs as a professional. Game Two: Won 7-3. Seranthony Dominguez (1-1, 2.12) gave up 2 unearned runs in 5.0 innings on 1 hit and 2 BB. He struck out four. Will Hibbs (0.00) pitched a perfect final inning. Henri Lartigue (.357), Darick Hall (.300)m and Luke Maglich (.261) had 2 hits apiece. Darick Hall hit his 2nd HR and had 2 RBI. Arquimedes Gamboa also had 2 RBI (4). 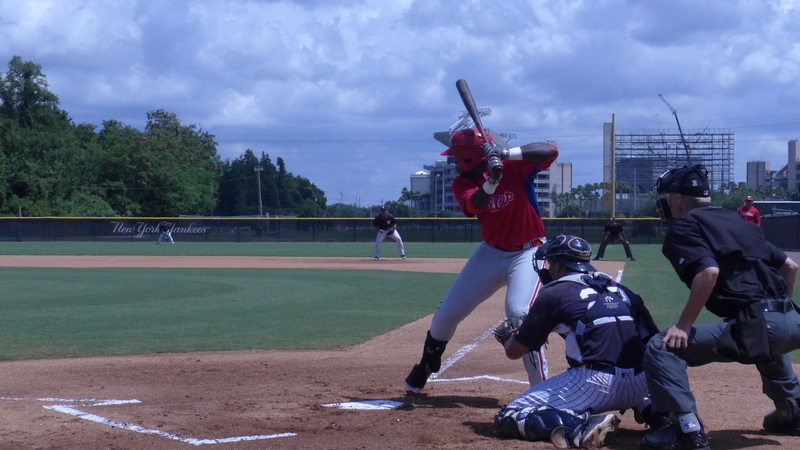 GCL Phillies (3-1) Beat the GCL Yankees East, 5-2. Luis Carrasco battled through 4.0 innings. He was fortunate to only give up 2 runs. Yoervis Medina pitched 2.0 hitless rehab innings. Justin Miller made his debut and got 5 outs in 1.2, scoreless innings while allowing 3 base runners. Jhon Nunez nailed down the 4-out save with 2 strike outs. Jesus Alastre and Edwin Rodriguez had 3 hits apiece. Alastre had the only extra base hit, a double. The Phillies faced a rehabbing 25-year old from Advanced A in the first two innings. By the sixth inning, they had tied the game on two unearned runs with the assistance of four Yankees’ errors. The Phillies scored three runs in the seventh to break a 2-2 tie. They used four singles and a sacrifice fly to forge their lead. #? Mickey Moniak went 1-4 with an RBI and BB. #25 Jhailyn Ortiz – DNP. The game featured the debut of #1 pick, Mickey Moniak, as well as the return of Cornelius Randolph. RHP Justin Miller made his debut in the seventh inning. Moniak sees his first pitch, a called strike. Randolph followed with his 5-pitch walk. The video picks up with the count 1-0. I’m sure he thinks he didn’t see a strike during the AB. I could watch him bat all day. Moniak’s 4th AB. A solid line drive to left. He drove in the go ahead run on this AB, his first hit AND first RBI. He later score his first run on a sacrifice fly. The guy on deck Edgar Jimenez made him slide even though the throw was cut off. Is that a form of hazing? I’m sure he felt some sort of nervousness early. He looked more poised in his later at bats. DSL Phillies (8-14) Beat the DSL Athletics, 3-1. Dixon Gutierrez (.389) went 3-5. Keudy Bocio (.269) went 2-5 with a double and RBI. Jonathan Guzman (.304) went 2-5. DSL Phillies2 (9-12) Beat the DSL Red Sox2, 3-1. Carlos Oropeza (.267) went 1-4. 6/29 – 2016, #27, RHP Davis Agle announces commitment to Clemson. Juco pitcher will attend ACC school for sophomore year. Hope it was a full ride. 6/29 – Phillies sent LHP Daniel Stumpf on a rehab assignment to Reading. 6/29 – Lakewood sent OF Cornelius Randolph on a rehab assignment to GCL Phillies. 6/29 – 2016 #26 pick, OF Tyler Kent retired with a .333 AVG (3-9 at WPT). 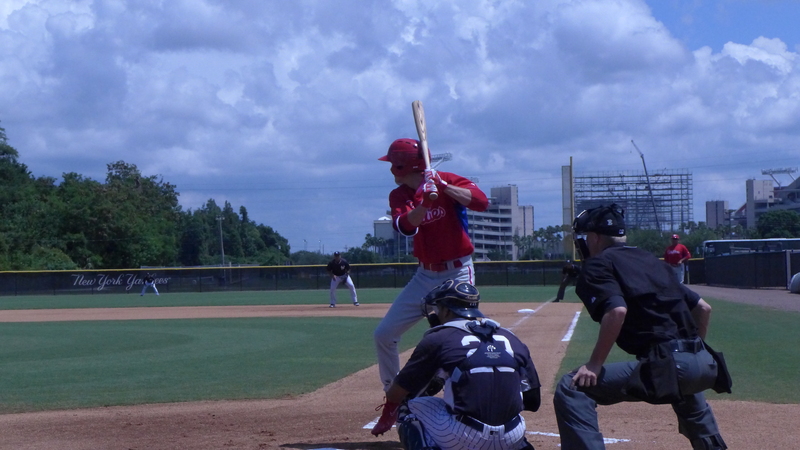 6/29 – OF Mickey Moniak assigned to GCL Phillies. $190,160 remains available for over slot payments until we learn any other over slot bonuses to prospects like Andrew Brown, et al. Excellent work as always, Jim. Will watch the videos later. Still confused about Kent retiring so quickly, but it’s not the first time I’ve seen such a quick decision and likely won’t be the last. I am curious as to exactly why he decided it. I wonder if a guy like that never really wanted to play. Signed and made a quick buck. Does he keep money? i was wondering the same thing. maybe he got a job offer in the real world that long term made more sense for him. I suspect that the standard contract signed by these draftees includes language that the signing bonus (or at least most of it) must be returned if the draftee retires within some time frame (maybe 1 year?). Certainly the teams would want that protection for players with significant signing bonuses, so players can’t just take the money and walk away. Maybe it’s different for guys like Kent, who as a college senior probably signed for $5k to $10k. I know of two kids who signed. One lasted a season and quit. the other not even a season. They both missed there girlfiends. Jake Reppert retired last year after one week at the Complex. He was a nice kid, easy to talk to. I was developing a nice professional relationship with him. He provided he with stuff like signing info that I couldn’t share here until I confirmed thru a second source. The ‘retirement’ may have been planned before the player even signed. I could see a situation where a player has a real world job offer but gets drafted anyway (it’s hard to crosscheck the 1,000’s of players who may get drafted every year) and tells the team that he doesn’t plan on playing long term after he gets drafted. The team and player then come to an agreement on a contract and minimal signing bonus so he can play a few games of professional baseball before he starts his ‘real’ life. Pretty sure the team isn’t going to throw a “few bucks” to the guy just for the fun of it, let alone add him to a roster and let him play as a going away gift. The HR crew are back working hard Reading won by 13 which I think covers the spread I Think. Jim ty great work ,I like the Mickey Mo video , Hall hit his 2nd Hr and SD pitched a good game again . Good to see C health and hitting again. The Phillies now have a 3 game wining streak . There’s an article I post in open Discussion from Phillycom. It’s an interview with Joe Jordan about how the new regime promotion procedeure works. Mr Jordan talks about what gets a prospect promoted it could Surpise some of you. From what he saying Cozens and Hoskins will be in Reading until SEPTEMBER. The strike zone management is the key thing how both hitters and pitcher’s control it . Well they both nigh have 35 HR and 100 rbi by then..
Could also be coach-speak also, keeping them motivated and working , heard enough of it in my lifetime listening to coaches..
We’ll sure see C. by the sea shore. Quick question, what would it take for Phils to land Matt Moore in a trade? LKW was beaten by Joan Baez. I wonder if Bob Dylan was sitting in? As a 75 year old, Baez no longer has much velocity. Must instead rely on off-speed stuff and pinpoint control. great photos/video of moniak’s debut. For guys like Agle and Davidson, who we know will not sign but will attend college, maybe add a statement in the “Notes”column such as “Will honor college commitment” or “Will attend Clemson”, or similar. Just something to indicate that these guys are off the board and will not sign. Anyone know if Moniak is playing today. I want to go today or tomorrow bit I would like to find out if he is playing first. Any update on Alex Wojciechowski? Guess he suffered an elbow injury around/after draft. Is it so bad that the Phillies can’t sign him and get him rehabbed? Since this site was introduced, Hoskins’ performance in June is probably the best single month-long hitting performance by a Phillies farm hand with the sole exception of Darin Ruf’s legendary performance in August of 2012. Hoskins is ON FIRE and is he two years younger than Ruf was when he took Reading by storm. I’m not sure that Cozens is quite ready to excel at AAA (don’t get me wrong, I love Cozens, but he’s got a little work to do in terms of chasing bad pitches), but I’m pretty sure that Hoskins is either ready or will be soon. But for Tommy Joseph’s presence in the big league line-up, the team might consider having Hoskins skip AAA altogether. Hoskins issue will be the number crunch that will happen by the end of 2016 season, not unless suddenly the Phils will contend this year or next year and Hoskins is the missing piece. the Phils still have a decision to make on some players like TJ, Asche, Ruf, Altherr and others who are in the 40-man that are cheap and still under control. It is possible that we can see Hoskins (if he continue this production) with the Phils at the same time next year, but I don’t see the Phils burn a roster space in 2016 to accommodate him. IMO, the best way is to keep Wrecking Crew (Alfaro, Coz and Hoskins) in AA and dominate from pillar to post while developing a bond and the winning atmosphere. Start the WreckingCrew in AAA in 2017 and promote if necessary anytime in 2017. Kurdt & Catch are either of you impressed with TJ’s performance thus far. For myself, realizing he needs time to settle in, I don’t see too much difference between him and Ruf. Ruf, I believe is better defensively and can be stuck in LF if need be. With the exception possibly of Hoskins our 1st basemen seem very ordinary. jim – no, i’m not satisfied with any of the 1B ahead of Hoskins – Howie, TJ, Ruf, Stassi, I don’t see any of them as part of the future. As a fan, I had enough of the scrubs and want to see the top prospects since i’m paying my $$. but i know that the team doesn’t need to be run in the vantage point of a fan. so the value of “roster space”, “service time” and “player development” something that fans don’t consider are valuable consideration by the FO. if you’re going to ask me who’s the best 1B in the organization – my answer is Hoskins. If this is basketball, you play the best player you have in regardless of their development. but this is baseball, the the mechanics is different. Hoskins doesn’t need to be added to the roster until the end of 2017. The roster space that he will occupy if added in 2016 is counterproductive because of the following: 1) Hoskins will not paly everyday and might split time with Howie and TJ (in minors he can bat everyday); 2) accelerates his service time; and c) the roster he will occupy in the 40-man can be a Rule V pick in 2016 (potentially another future piece like Doobie). Stobbe is in GCL lineup today as SS! According to Chris King of 2080 Baseball, 17 YO Sixto Sanchez looks great for GCL Phillies today (5 IP, 8 K, 1 BB, 91-95 MPH). Also says Jhalyn Ortiz’ double was one of the hardest hit balls he’s seen this year. The next wave of LA arms, Sixto Sanchez . As many of you know on Friday June 25th I had an accident. A large price of metal hit me in the head/eye resulting in a fractured nose, 2 fractured orbital bones, and most significantly, the loss of vision in my right eye. I was immediately taken to the ER and then transferred to Bascom Palmer Eye Institute, the #1 eye hospital in the world. That night, the doctors informed me that the damage to my eye was extreme and essentially that my eye had been crushed like a grape. The doctors told me they were going to do everything possible to reconstruct it but in all likelihood I would never regain sight in my right eye. The first surgery was somewhat a success but overall nothing had changed, so after discussions with my family and my doctors, it was decided that the best chance I had to live a normal life was to have my right eye removed and have a prosthetic one put in. This decision was not an easy one to make but to me it seemed like the right one so on Tuesday afternoon I went forward with the surgery. I'm currently still in Miami recovering from surgery but I'm doing well. This has been the hardest week of my life but I've had amazing support from my family and friends to help me get through it. For those who have been wishing me well, your support has not gone unnoticed and I appreciate everyone who has kept me in their thoughts and prayers. I had the best doctors in the world doing their best work on me and for that I am grateful as well. Although this injury has been tough it could have been much worse…I'm lucky to still have vision in my left eye…I'm lucky that i didn't have brain damage…and I'm lucky to be surrounded my the most loving and understanding people in the world. I just wanted to write this message to let everyone know that even though I suffered some bad luck, I'm not dead. I'm gonna be alright, I'm gonna persevere, and I'm gonna succeed. It takes more than this to bring me down. Again thanks to everyone for the support. That is freaking awful. I feel terrible for that guy. What stadium did this happen in? It happened on the road at the Brevard County Manatees stadium. This is absolutely heartbreaking. Poor kid! does this mean it’s the end of the road for Imhof? I wish him well and hope he won’t give up as a MLB player even if his career will lead to the bullpen. Imhof will still be able to lead a productive life, just not in baseball. I wish him well in his future endeavors. It’s hard not want to shed a tear when you read this and also to crack a smile given his positive attitude. How can you not like and admire this kid as a human being? Mark me down as a big Matt Imhof fan. What a guy! As for his future, I’m not sure how you pitch with no depth perception. I guess it’s possible, but it wouldn’t be easy. Urias situation probably works for him. it looks like he’s aiming like in archery or darts. Technically speaking he would be fine to pitch in the future(talent aside). Three things of note. 1.85% of visual field is inherent in each eye. That means only the peripheral 15% is from each individual eye (excellent redundancy in our construction). Secondly, The mechanics of pitching have little to do with eye sight. Since he is younger he has a chance to develop parallax, a unique phenomenon that allows one eyed individuals or equivalent individuals to simulate depth perception. 3. Injury to a dominant eye could be more damaging. Technically speaking most of us spent 90 % or greater of time using one sole eye. You’ve gotta love the voting buttons on this site. I just wrote the most glowing thing imaginable about poor Matt Imhof and someone HATED that comment (maybe they are rooting against him – who knows?). Good luck with your angry life anonymous voter! Having lost vision in one eye along with my amateur soft ball career, I feel deeply sorry for Matt. Sadly his professional career is over. Depth perception is big in any hand-eye sport. God bless him as he presses on. Really bad luck for Matt Imhof, losing an eye to a freak accident like that. However you’ve got to love his attitude. It’s an awful injury and may mean the end of his baseball career, but at least he can still lead a normal life. And with the attitude he displayed in that message, I think he’s gonna be alright. Best wishes to Matt Imhof in his recovery and life going forward. Good bless good luck I never lost vision but when I was born I had A lazy Eye lid. They did surgery cut the tendon to much my lid can’t blink unless I do it . They told my parents I would lose my eye do too dryness . I still have both and can see with stand glasses. I just use otc eye drops , I only have problems in dry or windy conditions. I truly believe God has a say in everything you never know . Doesn’t Belge who was drafted his yr have 1 eye. Yes…the LHP HS pitcher from NY did have an eye issue. Not a great day for top draft choices in the GCL. Moniak 0 – 3, ‘C’ 0 – 3 with a K, Cole Stobbe 0 – 2 (played SS). On the other side, J. Ortiz went 2 – 4 with 2 dbls and 4 RBIs. Josh Stevens (#11 draft choice) 1 – 1 with BB. Even Rogers 1 – 1 with a triple and a BB. No frustration or judgement here. Just cold hard facts. I don’t come here for the facts!! Regarding Appel- I thought he was rule 5 eligible in 2017, but according to Matt Gelbs’ article on philly.com about Mark’s injury, Matt says that he’s rule 5 eligible this year, and will have to be put on the 40 man roster after this season. So is he rule 5 eligible this year, or next? @dag54 – i disagree with Matt Gelb. Appel was drafted in 2013 as college player (age 19 and up), therefore, eligible for Rule V after only 3 years (or 3 Rule V draft). Appel is eligible this year. Likewise, the 60-DL doesn’t apply off season so Appel will occupy a space in the 40-man to protect from Rule V this year. @guy84 – my bad. so i agree with matt gelb and disagree with dag54. Ok. Thanks for clearing that up for me. KuKo….also he cannot qualify to be placed on a 60 day DL since from what I was told is non-existent in the offseason. Appel was drafted out of college in 2013, so he has 4 years before he has to be put on the 40 man. As 2016 is his 4th year, he will have to be on the 40 man by the end of this season or he will be lost in the rule 5 draft. Oh. Ok. Thanks to you and Kurdt Kobeyn for answering my question, and clearing up my confusion. After story about Matt it is all I can do to report. Read former Phillie Tyson Gillies signed with the Kansas City T-Bones of the American Association. I’m so sorry to hear about Imhof but that’s where I thought things were headed. Matt, good luck with your recovery and I’m sure there are plenty of gyms out there for you to coach in. Your brave response is inspiring. Good luck. Heartbreaking story on Imhof…as a player I was not his biggest fan but it was very interesting to see how he progressed as a bullpen arm. As a person, wow, what can you say, to post something so positive…really says something about his character. Wish him all the best. If he tries a miracle comeback to baseball, great, if not I hope whatever he ends up doing brings him nothing but happiness. The greatest thing about Matt Imhof is that smile in the picture. Gotta admire him and wish him well. FrankF…..that is truly a remarkable attitude from the kid and the best of luck to him going forward. You would think he’s in the best possible position to come back . . Meaning as a pitcher (however the Right eye as a LHP would be the worse of the 2). We do drills with our middle school and high school pitchers where they pitch blindfolded (you can slightly see for safety purposes but only a few feet in front of you) . . This helps them get a feel for their mechanics. Anyways some of the better pitchers can stay around the plate bc they can feel what is correct and repeat it. So with one eye I would think it’s possible (maybe 98.9% going against it). It would be awesome if the Phillies told him “if you can get yourself back out there and throw strikes we’ll get you in a game for an inning (either LHV or where he just left)” get him outta there and then name an organizational award after him “The Matthew Imoff Award for perseverance”. Good game for Danny Zardon with 3 hits and 0 K. If not for Lucas Williams, I think he is more appropriate in WIL. Nice debut also for Josh Stephen and Andrew Brown. Hope we can hear some scouting report from Jim (and others) for both of them. GCL OF looks crowded while WIL is thin. Laird is probably going to WIL or LWD if Coppola jumps to CLW. And don’t forget 17-year old J.Ortiz…youngest player on the team. @romus – yeah, how can i forget the exciting OF trio (or quad) of Mickey, Ortiz, Stephen (and Pelletier). GCL is probably the most intruiging group within the organization with the crowded OF and pitching staff of Fanti, Stewart, Gowdy and Young. Jake Kelzer of WIL is my sleeper in this years draft. 6′ 8″ 230 RHP with potential plus FB (currently sitting 90-95), good control and solid mechanics. SL is catching up with CH not far behind. Looks like a future closer profile to me and probably ready for the big show when the Phils starts to contend in 2018. Good whiff ratio at Indiana as a relievert. My heart goes out to Matt Imhoff. All the best in the future. What a great attitude. I was able to attend the doubleheader for Williamsport last night. Here are some random observations. There are a lot of really good athletes on this team and in many different sizes.I don’t know how many will be major leaguers but they will be very interesting to follow. The three LA infielders are built about the same and all can move. William Cuicas was the most impressive and was able to square up the ball and hit some ropes. He can play 2B and 3B. Arq Gamboa had a couple of really tough chances and didn’t get a break from the hometown scorer which was surprising to him. His double down the LF line was smoked. Luis Encarnacion is built like a NFL Linebacker. No way is he 6-2 185 according to the Cutter website. They list Dave Martinelli at 6-2 209. No way Martinelli is 24 lbs bigger. I would list LE at 6-2 225. Juan Luis is a beanpole at 6-4 and maybe 175. Seranthony Dominguez was the more impressive starting pitcher(Ranger Suarez). Had a one hitter going until I left in the sixth inning I think. He threw 92-93 consistently and seemed to hit his spots with the exception of that one tough inning. Bounced a couple and threw one to the backstop. He needed to get a hold of himself like a lot of young pitchers. Big part of this game is learning and overcoming adversary. He also benefitted from three really fine defensive plays including two inning ending diving grabs in RF by Luke Maglich. Darick Hall has a real nice stroke. Little bit of an upper cut. Hit a long HR to rightcenter. Second AB smoked one down the RF line. He must not have many triples in his life because he settled for a double. He never picked up the 3b coach/manager. He only looked over with about two steps from the bag when he coasted into 2b. He should have been on third. It’s the little things. Three or four pitches later there was a ball to the back stop which would have easily scored him if he was on third. Not to belabor the Nick Williams situation but last night David Martinelli had the identical situation occur. Hit a hard one hopper to the pitcher. Martinelli busts out of the box and hustles down the line. The P seemed a little unsure what he wanted to do. Throw it or run it over for a soft toss. He decided on the latter and got the out on Martinelli by two steps. Stuff happens (i.e the Cubs pitcher Jake A that has a mental block throwing to 1b). Never assume the out and never concede the play. Last week one of our minor league teams won a game when the opposing P threw the fourth ball of an intentional walk over the catchers head to the backstop. Tri-Valley’s Stephen Wrenn is an awesome player. Had two HR’s in the doubleheader and I noticed he has one tonight. That is 6 or 7 HR’s already. Daz Cameron appears to me that he wants to hit a homer every time at bat. Tri-Valley fans are something. They would give the fans in Baton Rouge or Columbia SC a run for their money with the comments. In case anyone still cares, AJ Puk just signed with Oakland for the exact slot amount of $4.069M. Cozens goes yard. 3run shot. 22nd with 63rbi. Hoskins goes yard, grand slam, number 22.